Published on June 17, 2011 in Daily Dirt and Dixie Contractor. Closed Tags: American Subcontractors Association, ASA, construction, construction industry, contractors, economy, subcontractors. Gov. 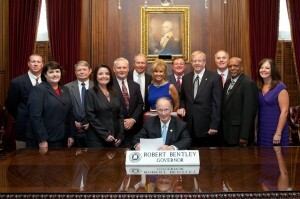 Robert Bentley (R) signs the ASA of Alabama-initiated retainage reform bill into law on June 9, 2011. The new law will help construction subcontractors get paid faster for the work they properly perform on privation construction projects. Alabama construction subcontractors are celebrating a major legislative victory that will help them get paid faster for the work they properly perform on private construction in the state. On June 9, Gov. Robert Bentley (R) signed S.B. 437, which limits the amount of retainage contractors can hold from subcontractors on private construction projects to 10 percent. For subcontractors that have had more than 10 percent retainage held from their progress payments, this change will greatly improve cash flow. Previously, there was no retainage limit on private construction projects in the state. The ASA of Alabama-initiated measure also makes several other improvements to Alabama’s retainage laws. It reduces the rate of retainage to zero after 50 percent of the project is completed. In the event that a contractor holds excessive retainage on its subcontractors, the contractor is required pay interest penalties of 1 percent per month. It also establishes a time frame for paying retainage on private projects. It states that the owner “shall release and pay retainage” to the contractor no later than 60 days after the contactor completes its work as defined by the contract, or no later than 60 days after “substantial completion” of the project — whichever occurs first. Payment of retainage to subcontractors is subject to the same payment terms. The law takes effect on Sept. 1, 2011.